THE story of Shri Ram’s life was first narrated by Maharishi Valmiki in The Ramayana, written after he was crowned as the king of Ayodhya. Valmiki was a great astronomer because he made sequential astronomical references on important dates related to the life of Shri Ram indicating the location of planets vis-a-vis zodiac constellations and the other visible stars (nakshatras). A similar position of planets and nakshatras vis-a-vis zodiac constellations has not been repeated in thousands of years. By entering the precise details of the planetary configuration of the important events in the life of Shri Ram, as given in the Valmiki Ramayana, in the software named Planetarium corresponding exact dates of these events according to English calendar can be known. Pushkar Bhatnagar, of the Indian Revenue Service, had acquired Planetarium from the USA. It is used to predict the solar/lunar eclipses and distance and location of other planets from the earth by the scientists and astronomers. He entered the relevant details about the planetary positions vis-a-vis zodiac constellations narrated by Valmiki and obtained convincing results, thus almost determining the important dates starting from the birth of Shri Ram to the date of his coming back to Ayodhya after 14 years of exile. This data was fed into the Planetarium software. The results indicated that this was exactly the location of planets/stars vis-a-vis zodiac constellations on January10, noon time in the year 5114 BC. As per the Indian calendar, it was the ninth day of Shukla Paksha in Chaitra month and the time was around 12 to 1 noontime. This is exactly the time and date when Ram Navmi is celebrated all over India till date. Shri Ram was born in Ayodhya: This fact can be ascertained from several books written by Indian and foreign authors before and after the birth of Christ e.g. Valmiki Ramayana, Tulsi Ramayana, Kalidasa’s Raghuvansam, Bodh and Jain literature etc. These books have narrated in great detail the location, the rich architecture and the beauty of Ayodhya which had many palaces and temples built all over the vast kingdom. Ayodhya was located over the banks of Saryu River with Ganga and Panchal Pradesh on one side and Mithila on the other side. Normally 7,000 years is a very long period during which earthquakes, storms, floods and foreign invasions change the course of rivers, destroy towns and buildings and alter the territories. Therefore, the task of unearthing facts is monumental. The present Ayodhya is shrunken in size and the rivers have changed their course about 40 km north/south. Shri Ram went out of Ayodhya in his childhood (13th year as per Valmiki Ramayana with Rishi Vishwamitra who lived in Tapovan (Sidhhashram) and from there he went to Mithila, the kingdom of King Janaka. Here, he married Sita after breaking the Shiv dhanusha. Researchers have gone along the route adopted by Shri Ram as narrated in Valmiki Ramayana and found 23 places which have memorials existing even as on date to commemorate the events related to his life. These include Shringi Ashram, Ramghat, Tadka Van, Sidhhashram, Gautamashram, Janakpur (now in Nepal) and Sita Kund etc. Memorials are built for great human beings and not for fictitious characters. Date of exile of Shri Ram: In Valmiki Ramayana it is mentioned in Ayodhya Kand (2/4/18) that Dashratha wanted to make Shri Ram the king because Sun, Mars and Rahu had surrounded his nakshatra and normally under such planetary configuration the king dies/or becomes a victim of conspiracies. The zodiac sign of king Dashratha was Pisces and his nakshatra was Rewati. This planetary configuration was prevailing on the January 5, 5089 BC. 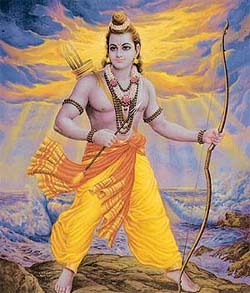 It was on this day that Shri Ram had to leave Ayodhya for living in the forests for 14 years. He was 25 years old at that time (5114-5089) and there are several shlokas in the Valmiki Ramayana which indicate that Shri Ram was 25 years old when he left Ayodhya for 14 years of exile. Valmiki Ramayana refers to the solar eclipse at the time of war with Khardushan in latter half of 13th year of Shri Ram’s living in forests. Valmiki has also mentioned that it was Amavasya that day and planet Mars was in the middle. When this data was entered, the computer software indicated that there was a solar eclipse on October 7, 5077 BC (Amavasya day) which could be seen from Panchvati. On that date, the planetary configuration was the same as has been described by Valmiki i.e. Mars was in the middle, on one side were Venus and Mercury and on the other side were Sun and Saturn. On the basis of planetary configurations described in various other chapters, the date on which Ravana was killed works out to December 4, 5076 BC. Shri Ram completed 14 years of exile on January 2, 5075 BC. That day was also Navami of Shukla Paksha in Chaitra month. Thus, Shri Ram had come back to Ayodhya when he was 39 years old (5114-5075). Ram Avtar, who had done research on places visited by Shri Ram during 14 years of exile and sequentially moved to the places stated as visited by Shri Ram in the Valmiki Ramayana, started from Ayodhya and went right upto Rameshwaram. He found 195 places which still have the memorials connected to the events narrated in the Ramayana relating to the life of Shri Ram and Sita. These places include: Tamsa Tal (Mandah), Shringverpur (Singraur), Bhardwaj Ashram (situated near Allahabad), Atri Ashram, Markandeya Ashram (Markundi), Chitrakoot, Parnakuti (on banks of Godavari), Panchvati, Sita Sarovar, Ram Kund in Triambakeshwar near Nasik, Shabari Ashram, Kishkindha (village Annagorai), Dhanushkoti and Rameshwar temple. Recently, the Sri Lankan government had expressed a desire to develop Sita Vatika as a tourist spot. Sri Lankans believe that this was Ashok Vatika where Ravana had kept Sita as a prisoner (that was year 5076 BC). An American company engaged in exploring the oceans had put pictures on the Internet of a curved bridge, the ruins of which are lying submerged in Gulf of Mannar between Rameshwaram and Sri Lanka. The age of the stones used has been estimated at 17 million years, though the period of the construction of the bridge has still not been estimated. From Kashmir to Kanyakumari and from Bengal to Gujarat, everywhere people believe in the reality of Shri Ram’s existence, particularly in the tribal areas of Himachal, Rajasthan, Madhya Pradesh and the North-East. Most of the festivals celebrated in these tribal areas revolve around the events in the life of Shri Ram and Shri Krishna. During Ram Rajya, the evils of caste system based on birth were non-existent. Valmiki is stated to be a Shudra. Sita lived with him as his adopted daughter after she was banished from Ayodhya and Shri Ram’s children Luv and Kush grew in his ashram as his disciples. Valmiki was, perhaps, the first great astronomer and that his study of planetary configurations has stood the test of time. Even the latest computer software corroborated his astronomical calculations, proving that he did not commit any error. Shabari is stated to be belonging to Bheel tribe and the army of Shri Ram, which succeeded in defeating Ravana was also formed by various tribals from Central and South India. Facts, events and other relevant details relating to the life of Shri Ram are the common heritage of all the Indians.